As many of us can attest, old age ain’t for sissies! One of the most common nuisances of old age (and hard living) can be sore joints — whether it’s from arthritis, sports, other physical activities, or just plain genetics, many of us have learned to grit our teeth and just live with it. But sadly, it’s a problem that can attack younger patients, too, who may have a harder time living with chronic pain and physical limitations. Artesia has always had good physicians and physical therapists to help with this problem, and now we have a brand-new facility to help them help us! 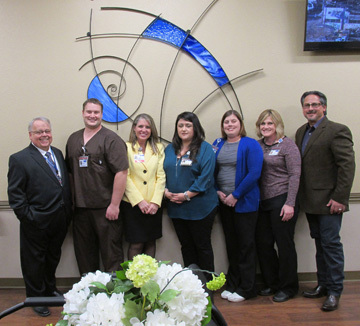 Artesia General Hospital officially dedicated its new Bone and Joint Destination Center rehab facility with an open house celebration last week, and this new-and-improved facility allows AGH to continue to grow and meet the needs of the region. Planning for the Bone and Joint Destination Center started nearly two years ago. The Center features a spacious waiting area with original art and a nice, big room for physical therapy, and it is — most importantly — a facility that allows the AGH team of professionals to provide a complete spectrum of joint care services under one roof, from initial diagnosis to treatment options to followup care. Physicians are now able to directly monitor their patients’ progress in physical therapy. X-rays are done in-house, and the Center also has the only robotic orthopedic equipment in New Mexico. Artesia General Hospital’s team approach to healthcare brings in patients from all over the southwest. Inpatient and outpatient services are available, as well as informational seminars. AGH’s goal is to keep patients and their families as informed as possible on all aspects of treatment from diagnosis, treatment, surgery and recovery, and to do this with compassion, respect and support. For more information on services, informational seminars, or anything else, check out AGH’s website at www.artesiageneral.com or call 575-736-8174.